How to I resolve command not found in AWS EC2? How to run a python script on AWS that monitors and download video streams? Autoscale Amazon Kinesis through Application Autoscaling or Lambda? I am a developer and new to the system engineering part, so still getting my concept clear. I need to deploy my chatbot in Lambda and host it using API Gateway, but following conceptual problem is arising. I have a chatbot built using simple AIML. I created it on python and its working properly. For those who don't know of AIML, here I create an image of the AIML kernel : k = aiml.Kernel() and then as the conversation flow happens this kernel image is important for the conversation. In my system, at an instance I just have one image of the kernel and things are good. But when I host this python program to Lambda and deploy it using API Gateway, for each request I will have a new image of the kernel, and my program will not function properly. In a chatbot the conversation is happening at runtime, and and past conversation data is important, but if I am using API Gateway to trigger the Lambda function each time the user writes a new line, then every time a new image will be created of the kernel. One option which I found was storing the user's session and conversation in a database. But in runtime if I am chatting, then the retrieval of past conversation and have the past conversation in the new image of kernel doesn't sounds a good way to go. Or, even if we store the past conversation and send to the Lambda function using some JSON payload, then also since a new image of Kernel will be created by API Gateway, I have to run all the past conversation first and then only get the response for the new dialogue in the chat. IN SHORT : How can I have one image of the kernel in the Lambda function, and get output using API Gateway, where the API is called multiple time for the same image of lambda function. Or even if you know the general idea, how most online chatbots process and give responses, then that will also be very helpful. All of a sudden no linux command(ls, vi, etc..) is working in AWS EC2 instance and I get message saying command not found. I had launched an EC2 instance and all linux commands were working fine. I then uploaded some files to EC2 and extracted them(setting up my environment). and I executed below command in my AWS EC2 instance. After this linux commands(ls, vi, cat, etc..) are not working, however "which", "pwd" commands are working. I need to run a script that monitors and downloads video streams so that I can later batch download them to my local machine. what AWS service would allow this and how to set it up? 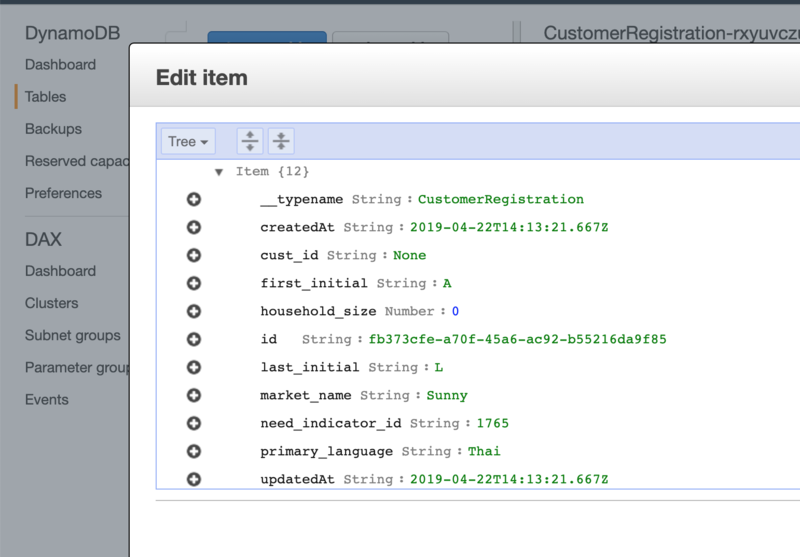 I have connected an iOS app to DynamoDB, which takes input from UITextFields in the app and creates items in a table called "Customer Registration." I am looking for example code that shows how to parse that table's information back into the app, see iOS App Storyboard here onto a label in a separate view controller. This project is for logging and retrieving customer information. I have read the AWS Amplify documentation, but I can't figure it out. //This button logs the information entered into the Customer Registration form. 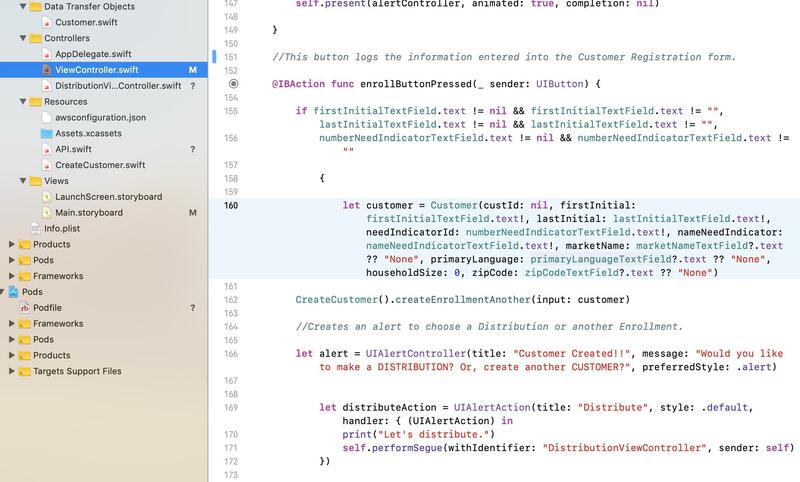 numberNeedIndicatorTextField.text != nil && numberNeedIndicatorTextField.text != ""
I would like to look up the customer in DynamoDB, so that I can make a distribution of funds to that customer. I am setting up an AWS API Gateway using Serverless. Ideally, nothing should be configured using the AWS console, only deploying with Serverless. I want to have it validate the bodies of requests coming in to the various Lambda functions that are also setup within this project. This validation should be done by comparing the body received to an associated JSON schema file. In the case of incorrectly formatted requests, I want the response to indicate what properties are missing or incorrectly typed. I found the serverless-reqvalidator-plugin to solve the problem of validating against a schema. The validation item is described in the Resource, the schema is associated with the validation item in the custom section using the serverless-aws-documentation plugin, then finally the function is associated with the validation object in the functions section using the reqValidatorName property in the http event. 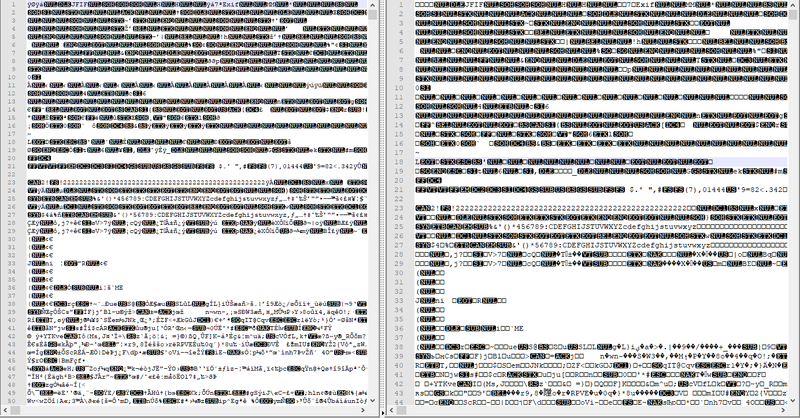 Ideally, somewhere in here, I'd like to setup what message should be returned in the response in the case of error. I did it this way as directed by this answer for a similar question. I would be interested in doing this without relying on the reqvalidator plugin, but in this example given in the AWS API Gateway documentation,it doesn't show how to do it with Serverless. It looks like this wasn't possible in the past, but it seems to be possible now. I can't find any examples using strictly the serverless.yml though. 1. Is it possible to add some property that dynamically explains what is wrong with the request body in the response message? 2. Is it possible to validate a request body against a schema just using the setup from Serverless for the AWS API, instead of using reqvalidator? I came across multiple solutions to autoscale kinesis datastreams through Amazon Cloudwatch and Lambda functions. Recently, AWS introduced another approach — Application autoscaling to scale applications like EMR, custom application like Kinesis etc through scaling policies, API Gateway and Lambda functions to autoscale. I have been searching for hours but can not find which approach is better and why? Why are we using API Gateway to invoke Lambda when we already can invoke lambda through SNS? Can anyone help me understand the need of API Gateway in second approach and also which approach is better? 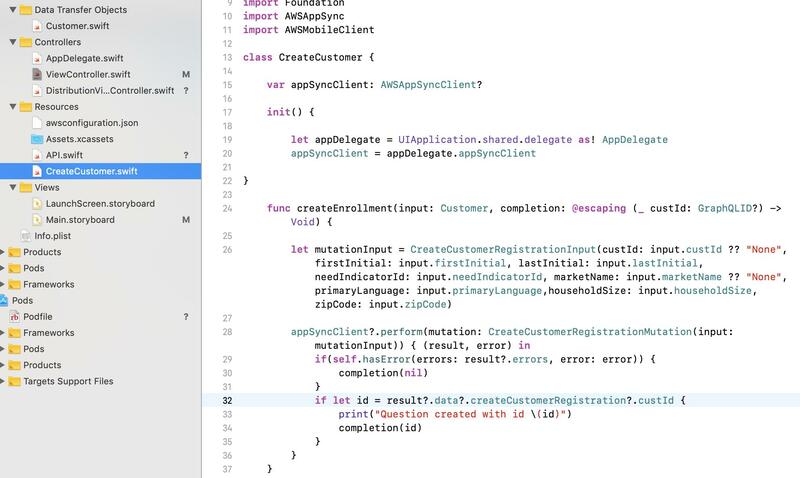 The ByteArrayContent data values are being changed to unreadable characters when outputted through a lambda function, which was created in Visual Studio 2015 and pushed to AWS Lambda. To be more precise, the bytes are passed onto a ByteArrayContent then put into a MultipartFormDataContent object that is sent off in a Post method to the API. Below is an image the input code on the left and on the right is the output.